Modern alpine ski racing technique has been a subject of many misinterpretations and controversies. 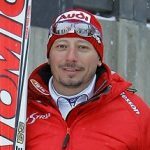 I have decided to clarify this matter by carefully studying the technique of ski racers who are currently the best in the world. 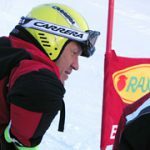 Although Austrians come to mind first, there are a number of racers from other countries who could be considered among the leaders in developing and using the modern GS and Slalom techniques. In other words, there isn’t just an «Austrian technique» that should be duplicated and used by the rest of the world, instead — there is International Modern Technique. All of the top GS and Slalom racers have similar trends in their skiing. These general trends of modern technique go far beyond racer’s body type and his individual skiing style. They could be used uniformly by all racers from developing junior racers to members of the national teams. The efficiency in the following techniques and biomechanics are reflected through the entire group of top World Cup racers. Turns on parallel skis are used in both Slalom and GS. There is no noticeable convergence or divergence of the skis at any stage of the turn throughout the entire run in the racecourse or while free skiing. It is not easily achieved on a consistent basis. During any type of a turn legs move in the opposite directions — outside one turns inward while the inside leg turns outward. Therefore keeping the skis parallel is a technical skill that requires mastering. Skis are kept parallel even in the turns with the pivoted entry. Although Modern Technique is geared towards clean arc to arc skiing the turns with some pivoting in the initial stage are still needed on the steep turny sections of the course. All of the top racers are very good not only at carving but at pivoting with parallel skis as well. There is an obvious speed advantage of parallel skis. It allows applying more pressure on the inside ski in the second part of the turn, which eliminates excessive locking of the edge of the outside ski. Now both skis are loaded and involved in carving smooth, faster arcs. If the skis were in scissored (diverging) position, loading the inside ski would result in either sliding of the outside ski or simply falling to the inside of the turn. In other words, diverging inside ski would not effectively contribute to carving. The edge angle is created primarily by inclination with extended outside leg. 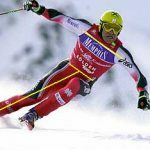 There is almost no knee angulation used in GS and it is kept to a minimum in Slalom. Straighter (more extended) outside leg creates a much stronger, biomechanically sound position that helps to withstand huge forces produced in modern turns. This position allows the skeleton, rather than the muscles and joints, to take the load, which greatly reduces the chances of injuries to a knee joint. The top group of athletes has on average much less injuries then the racers at lower level, mostly due to more biomechanically sound technique. Inclination with parallel legs allows for the Center of Mass to travel by much shorter, more direct path through the gates. Combination of parallel legs/shins and parallel skis allows for both skis to carve. All of that result in significant time gains. The top racers have on average 80:20 ratio of outside to inside ski pressure in Slalom and 70:30 in GS. This ratio is constantly changing throughout the turn. Normally the turn is started above the fall line with 90% of pressure on the outside ski. Upon entering the fall line inside ski is starting to carry more load while it is not only assisting in maintaining lateral balance but is actively contributing to carving. It is normal to see a ratio of 60:40 in the second part of a turn. It could even be 50:50 throughout the most of a turn, but only on the flat less turny sections of a course. Loading of inside ski works and produces speed advantage only if skis are kept parallel throughout the entire turn. Although there is a significant lateral split between the skis in Slalom and GS the split in sagittal (fore and aft) plane has been reduced. Having ski tips almost level, especially in the first half of a turn, assists in keeping them parallel and carving early. Sagittal split produces unnecessary counter-rotation and could also cause premature loading of the inside ski. It could alter lateral balance and affect carving of both skis. Keeping minimal sagittal split maintains square relationship between upper and lower body through the first of a turn. This is the most natural and biomechanically strong position similar to the downhill tuck, the most efficient position in skiing. Both types of cross movements are used in Modern skiing. Crossover (CM of mass crosses over the skis) is prevalent in complete GS turns on steep parts of the course. Crossunder (skis cross under the CM) comes into play in slightly more shallow GS turns on the flatter sections. Crossunder is extensively used in modern Slalom. It is usually combined with down-unweigthing. Regardless of type of cross movement the modern GS and SL turns use the entire ski. The turn is usually finished with the pressure on the tail and started with some pressure on the front of the ski. Both types of cross movements not only place the skis on the other side of the body for the next turn but also assist in recentering — shifting the pressure from the tails to the front of the skis. In reality, crossover and crossunder work in concert, providing for simultaneous lateral and forward movement of CM. Combination of skis carving tip-to-tail and quick efficient cross-over and cross-under movements into the new turn produce an early edge set. Down-unweigthing is used in SL and GS as the way of unloading the skis to allow them to cross-under the body for the new turn. It creates a so-called «virtual bump» between the turns. Skier retracts his legs just as if he was going over the bump in the transition phase and extends them into the turn as it was the galley in between the bumps. Combination of down-unweigthing and cross-under movement works well in shallow turns on moderate terrain. It provides for an early edge set and carving with both skis which makes for much faster skiing through the moderately flat sections of the course. Modern GS and Slalom turns are not perfectly round. Instead, their shape resembles a long comma. Most of the direction change is done above the fall-line. Therefore carving should start above the fall line as well. That allows racers to accelerate out of the fall-line having about 70% of a turn completed before the gate. In order for that to happen, ski needs to be tipped on its edge very early in the turn. Well timed cross movement in combination with extension and inclination positions the body inside the turn before the pressure is really built on the outside ski. Occasionally, it could result in initiation of the turn on the inside ski, which is a technical error, often mistakenly considered to be a part of Modern Technique. There is a fine line between an early edge set and leaning in on top of the turn. Top racers can sense it most of the time. In order to maintain speed and even accelerate out of the turn skis need to be loaded above and into the fall-line. It has more impact in GS but produces time gains in Slalom as well. Top racers release the pressure coming out of the fall-line. It is very important as forces (gravity and centrifugal) match upon exiting the fall-line, creating stronger reaction force from the snow, resulting in deceleration. Combination of a cross movement, early edge set and pressure in the fall-line with early release are used to produce acceleration in Slalom and GS turns. While analyzing the ski technique it is important to separate the elements of individual style or some technical inefficiency from the trends of Modern Technique. Studying ski technique of the top racers produces very objective results as the fastest racers exhibit the best technique, which is not affected by style or need to create a certain impression. If and when a particular technique produces fast times it is adopted and used by the others. There are a number of technical progressions and drills the top racers use in their training in order to become more efficient. The eight characteristics of Modern Technique listed above are tightly intertwined with each other. Most of them could only be effectively used if the other ones are present in skier’s technical arsenal. Only the combination of all eight performed in the right sequence creates this powerful yet graceful Modern Ski Technique.